James' Jetsam - Your Cruise Expert: Can I wear a kilt on my cruise? You can if you want to. People do. It's correct that people have worn kilts in the Highlands since at least the sixteenth century but the idea of clan colours is a modern invention that can't be dated back further than the nineteenth century. 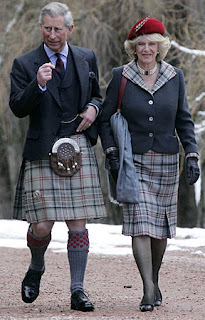 Before then kilts were just designed in whatever tartan the weaver liked the look of. You can find traditional highland paintings dating back to the Seventeenth century with every different Scotsman wearing a different patterned kilt, even when they were related. In fact the idea of 'clan' colours really began on April 8th, 1815 when the Highland Society of London started naming and registering different tartan patterns and ascribing them to the different clans. The modern 'Royal ' tartan, (Balmoral), was designed by Prince Albert and dates back no further than him. So in answer to my question, feel free to wear your kilts on a formal night, (I actually think they can look quite smart), but don't spend the evening talking to me about your clan colours when I know for a fact you can't date them back any further than an 18th century fad started by Queen Victoria and Prince Albert. You can. It is everyone's right to wear their favorite mens kilts. Thanks. the clans themselves were based in different regions and a lot of tartans are named after towns and regions of Scotland. the Highland Society of London clearly felt it proper to attach a tartan of an area to the clan that held the area when people still wore kilts to anything but celebratory events. I honestly hope you don't think they just matched up patterns and names with a lottery. People have been embroidering patterns into things and keeping track of such for thousands of years, you can't read the first paragraph of a wikipedia article and then undo that fact. look at national flags for examples, People associating patterns with names isn't new or exclusive to the highlands of Scotland. Thanks to shared this great information about jamesjestsam cruise.